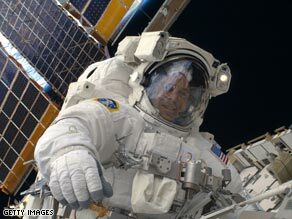 (CNN) -- Two Italians, a Dane, a German, a Frenchman and a Brit walk into a space station... or will, in 2013, if all goes according to European Space Agency plans. Europe's six new astronauts hope to join their American counterparts on the Internation Space Station. The six new astronauts named Wednesday were chosen from more than 8,400 candidates, and are the first new ESA astronauts since 1992, the space agency said in a statement. They include two military test pilots, one fighter pilot and one commercial pilot, plus an engineer and a physicist. "This is a very important day for human spaceflight in Europe," said Simonetta Di Pippo, Director of Human Spaceflight at ESA. "These young men and women are the next generation of European space explorers. They have a fantastic career ahead, which will put them right on top of one of the ultimate challenges of our time: going back to the Moon and beyond as part of the global exploration effort." Humans have not walked on the moon since 1972, just over three years after the first manned mission to Earth's nearest neighbor. The six will begin space training in Germany, with an eye to being ready for future missions to the International Space Station and beyond in four years. They are: Samantha Cristoforetti of Italy, a fighter pilot with degrees in engineering and aeronautical sciences; Alexander Gerst, a German researcher with degrees in physics and earth science; Andreas Mogensen, a Danish engineer with the private space firm HE Space Operations; Luca Parmitano of Italy, an Air Force pilot with a degree in aeronautical sciences; Timothy Peake, an English test pilot with the British military; and Frenchman Thomas Pesquet, an Air France pilot who previously worked as an engineer at the French space agency.